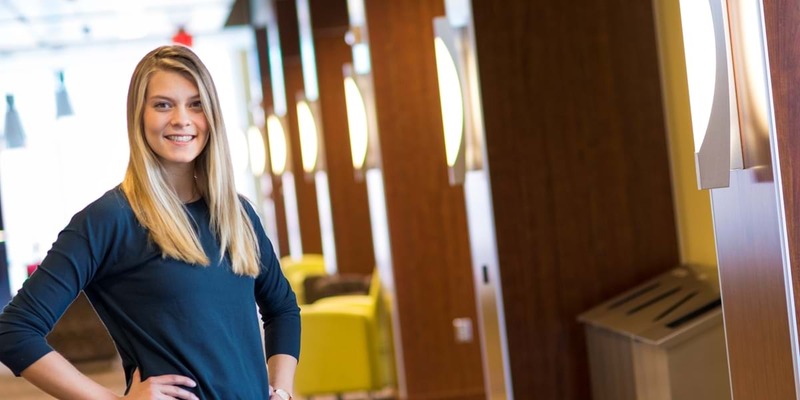 Regan wasn’t set on a particular major or career path when searching for a college, but she found that Northwestern offers many strong programs. She felt confident that a Northwestern education would benefit her in any degree she chose. Now a business administration and marketing major, Regan has been a peer tutor and served as a student assistant for two economics professors. She plans to attend law school after graduation. I met with staff members in the Career Development Center who assessed my interests and directed me to some professors in different majors they thought would interest me. I met with some business professors and took some classes that I enjoyed immensely. I had in the back of my mind that studying business would open options for me—and it has, as I have decided to pursue law. We always talk about ethics and integrity in my business classes, which I appreciate. Discussing cultural interpretations and differences is interesting, but a Christian perspective is what really draws me in. Acting with integrity and honesty is not easy in a broken world, but Christians are called into every field to lead and minister among people. I have learned that though my work won’t be in a church, I can still do God’s work in the world, which has encouraged me about my choices for the future. Northwestern professors are approachable, and they interact relationally with their students. My professors know who all my classmates and I are and have a genuine interest in our success. The business professors also helped me find my summer internships and gave me information about law schools. I love knowing that I can go to the third floor of Van Peursem Hall to connect with my professors and be encouraged in my education now and my future choices as well. Formal Friday events are my favorite thing about NWC’s business department. On Formal Friday (which doesn’t always occur on Friday! ), business students and faculty wear business attire and meet together—and the professors supply snacks. No event is the same: Sometimes speakers talk with students, and other times we talk about specific topics. Once, employers from the area came and assisted students with their resumes and interviewing skills. Formal Friday events have been an invaluable way for me to get to know my professors and gain knowledge to prepare for my future.